March 13 marks the 25th anniversary of a film that’s considered one of the most accurate interpretations of courtroom procedure, “My Cousin Vinny.” The movie is used as a tool to demonstrate voir dire and cross-examination to young lawyers and has been praised by law professors, authors and circuit court judges. But instead of an intense court drama or who-done-it thriller, “My Cousin Vinny” delivers an insanely hilarious tongue-in-cheek courtroom comedy that even the late Supreme Court Justice Antonin Scalia enjoyed. The movie starts with Billy Gambini and Stan Rothenstein, played by Ralph Macchio and Mitchell Whitfield, two New York college students who accidently shoplift a can of tuna from an Alabama convenience store. How does one accidently shoplift a can of tuna? That’s the least of their problems, as the two quickly find themselves suspected for the murder of the convenience store clerk who was killed the same day. Circumstantial evidence has the boys seemingly caught red-handed, and when Billy’s confession about shoplifted tuna is hilariously misconstrued as a confession for the shooting, the pair is officially charged with murder. Enter Vincent LaGuardia Gambini, played by a very “Pesci” Joe Pesci, a newly appointed personal injury lawyer who, after his sixth bar test attempt, is ready take on his first day in court. Vinny is a crappy lawyer. He spends half of the time arguing with the judge. He stands out like a sore thumb in his leather jacket, and his New York accent is so thick that you’ll start talking like him halfway through the film. 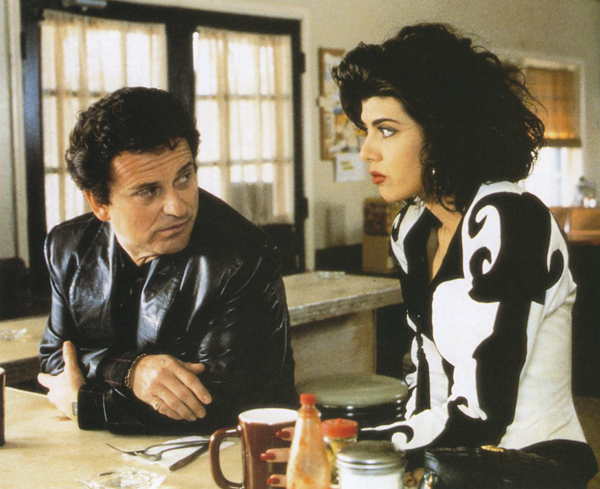 Vinny’s lack of knowledge in basic court procedures and overall abrasive, Joe Pesci-ish attitude is paired with the equally abrasive style of his fiancée, Mona Lisa, played by Marisa Tomei. Their interactions as the stereotypical Italian-American New Yorkers in rural Alabama make the smallest conversations the most comedic moments. Vinny and Lisa run across the town and are introduced to Southern grits, deer hunting and Alabama livestock. The film is a reminder of what phenomenal actors can do with a simple concept. Tomei even won the Academy Award for best supporting actress. She steals every scene she’s in and proves to be Vinny’s only support for a majority of the movie. The movie does have its eyeroll moments and some slang and references date the film. But these are soft blows to the overall quality. The film even holds a few more serious themes throughout. The film mentions the possibility of error trails leading to the death sentencing of an innocent individual. The comedy of the movie keeps anything from sounding preachy, but the point is still there. The film was more successful than initially anticipated and received generally positive reviews. Lately it’s been ranked among the best courtroom films of all time by the book “Reel Justice” and the American Bar Association Journal. This film has aged well, with its funniest and most quote-worthy moments only getting even funnier when you’re anticipating them. It’s an entertaining situational movie with two great actors that elevate the film beyond other “fish out of water” movies. Thought everyone would like to know that Vinny & Lisa are returning in a new comic thriller series of novels beginning this Memorial Day with the release of BACK TO BROOKLYN. For more info follow BACK TO BROOKLYN on Facebook and at my-cousin-vinny.com.